Jerry Jeff Walker spoke those tongue-in-cheek words over 40 years ago as the tapes rolled on his recording “Gettin’ By”. It was a knowing wink that while the song was simple and somewhat off the cuff, Jerry Jeff knew he was on the brink of a movement. It may not have been a monster track, but it was part of a monster moment. Texas Music has had a few of those throughout the past five decades. We’re on the cusp of another one this week with the twin releases of two highly anticipated albums. 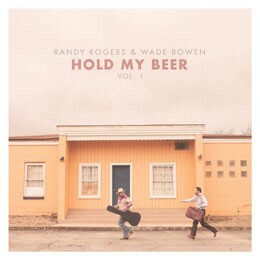 The Randy Rogers-Wade Bowen duets record Hold My Beer, Vol. 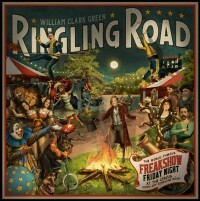 1 and William Clark Green’s Ringling Road. The anticipation for each is for different reasons. Ever since Pat Green and Cory Morrow released the rollicking, Lloyd Maines produced Songs We Wish We’d Written Vol. 1 in 2001 there has been a void of that type of vibe and music in this scene. It was a shoot from the hip, free-wheeling ride through some of their favorite tunes. Morrow has never sounded finer and Green has never sounded like he’s having more fun than on that collection. Into that void, 14 years later, steps Rogers and Bowen. For many years these two have taken their Hold My Beer acoustic songswap concept and made it half house party-half listening room. This record bends more toward the party aspect. It reeks, in the best possible way, of late 70s/early 80s country music debauchery. This new Hold My Beer record sounds as if the ol’ Bocephus “All My Rowdy Friends” video has come to life. That’s the vibe it has. It’s fun, it’s honky-tonk, it’s true. Simply, it’s country music. After coming out of the other side of the Nashville factory and living to tell about it, Rogers and Bowen are enjoying what they have and not chasing what they don’t. That satisfaction and relief is evident in this Maines’ produced collection. One of the most hyped and heavily anticipated releases in this scene’s history lives up to its billing. William Clark Green burst on the scene, as so many before him, via toiling away writing songs and singing in the bars of Lubbock. His career built relatively slowly as it grew on the back of each album release. His last album, Rose Queen, was a testament to being in the right place at the right time with the right songs (and producer…Rachey Loy). Loy’s back at the wheel again and WCG has bolstered his sound by adding more guitars (Josh Serrato of 6 Market Blvd fame) and a broader scope of sounds and styles. It’s another bevy of songs that feature a wide range of thematic elements including relationships and small-town Texas life. Watching an artist enter their creative peak is one of the most thrilling aspects of being a music fan. Much like athletes, musicians have career arcs and William Clark Green is poised at the top of his roller coaster. He’s got the buzz and growing audience to soak up these new songs and sustain that peak for quite a while. Hold My Beer, Vol. 1 and Ringling Road are different albums, but cut from the same cloth. They come from different inspirations and points, but seek the same truth. They’re a raw, real alternative to bros, dirt roads and sugar shakers. Even at their most fun, they’re packed with thought. We’ve all been craving something with a little depth, a little heart and a touch of commercial appeal without sounding slick. These records do that. They’re not really monster albums, but they’re each as important (for different reasons) as any Texas record of the past five years. Next PostWalt Wilkins' guitar is home!